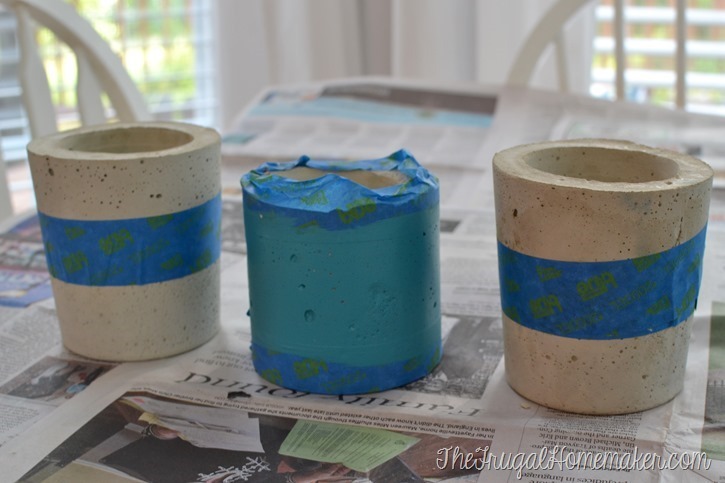 I was challenged this month by DecoArt to paint something concrete and I was so excited because this was finally the excuse I needed to try making my own concrete planters! 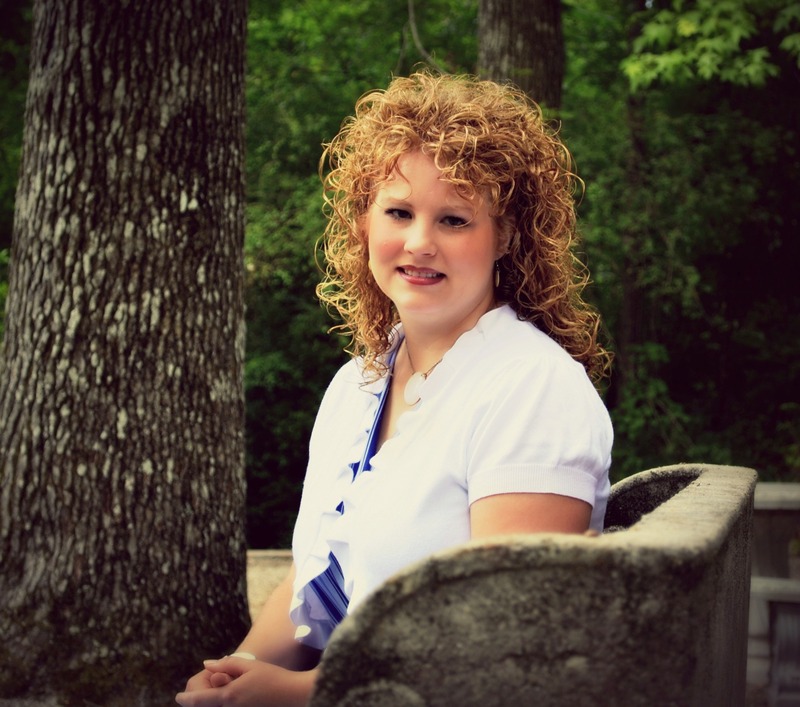 Have you seen them on Pinterest? They are so cool looking and I couldn’t wait to make my own. Plus I have never worked with concrete or cement before and I always love getting to learn a new area of DIY. 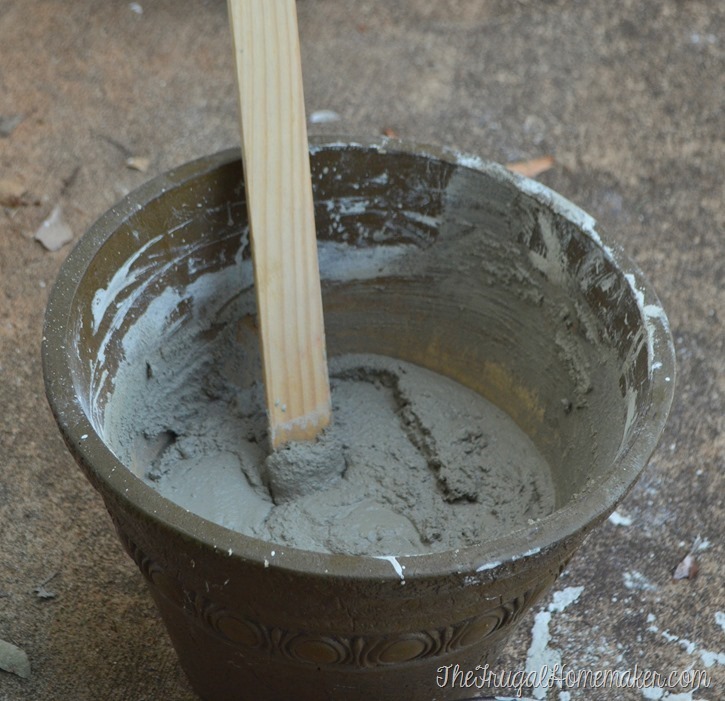 I read several tutorials on making concrete planters and many recommended getting this type of concrete (actually cement!) 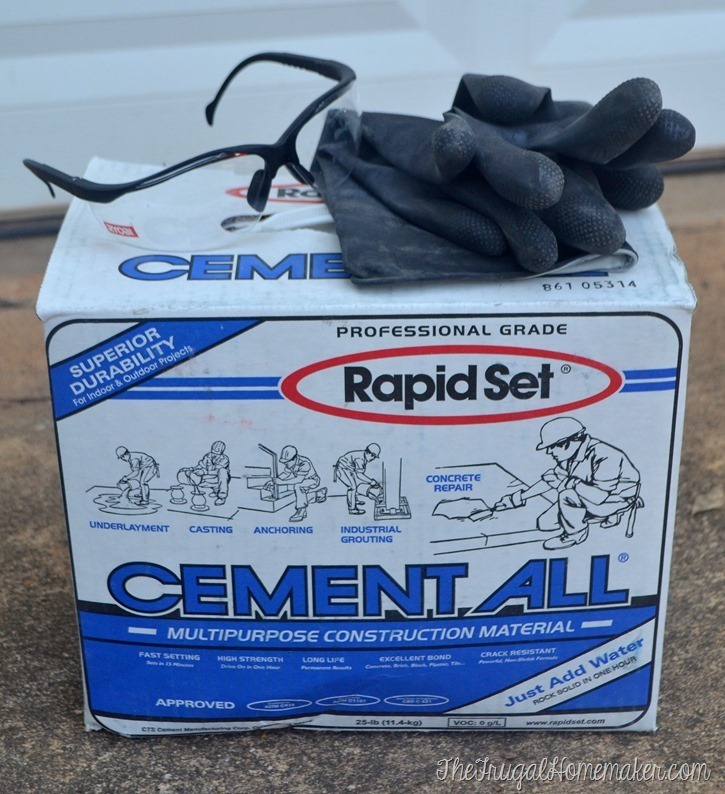 – Rapid Set CementAll. This will set up fast, be more white/light gray in color, and also won’t have all the rocks and graininess that regular concrete will have. I was a bit shocked at the price (a box was about $12 at Home Depot) as I was expecting a $3-4 back of concrete mix. But I didn’t use all of the box so you definitely can get several planters or objects out of one box of cement and bring your cost down. 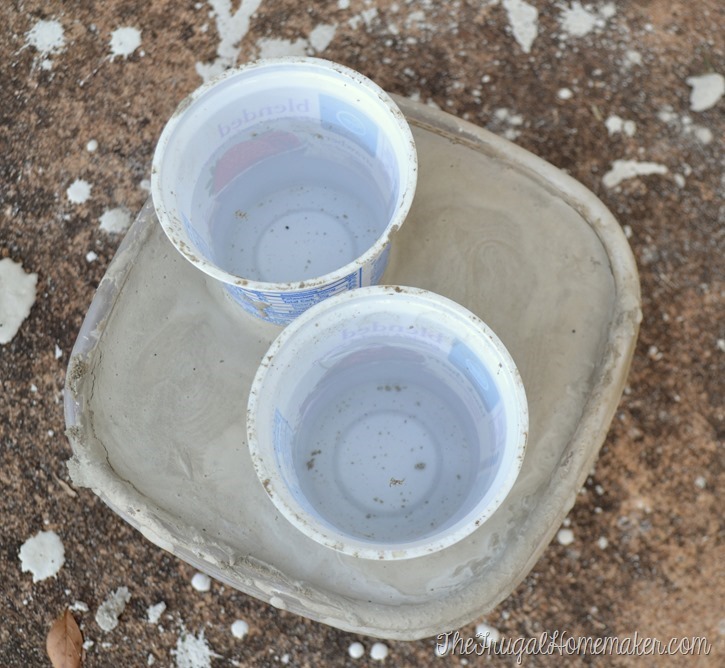 If you are planning on making your own concrete planters start saving containers several weeks beforehand or raid your recyling bin to find disposable containers in the sizes you need. 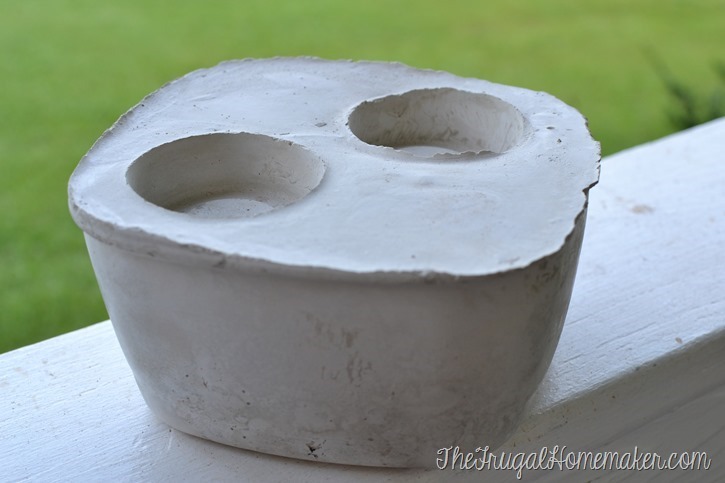 You will want containers that are sturdy so the walls will hold the concrete and you also want containers that will fit inside of each other to form the place for the plant or candle. Apparently we drink a lot of Dunkin iced coffees and eat a lot of yogurt in our house. I was trying to find matching or coordinating sizes of containers. 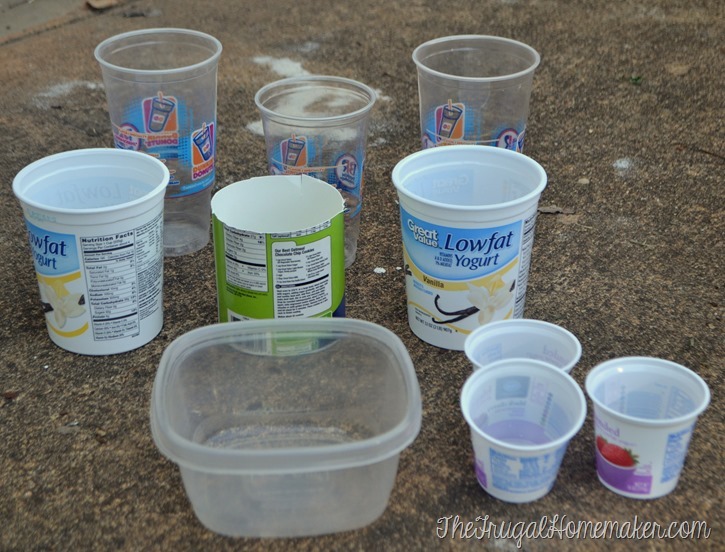 Spray the inside of your containers with cooking spray liberally!! This will help the concrete come out easily once it is dry. Then it’s time to mix up your concrete. (Please read the box for full instructions but I highly suggest wearing heavy duty gloves, eye protection, and a mask when working with concrete or cement.) Don’t do what I did and think it said 1 part concrete to 4 parts water. NO, it is 4 parts concrete to 1 part water… Like I said, I like learning how to work with a new aspect of DIY products even if I make a few mistakes in the process. Here’s my 3 planters poured and ready to set up and dry. 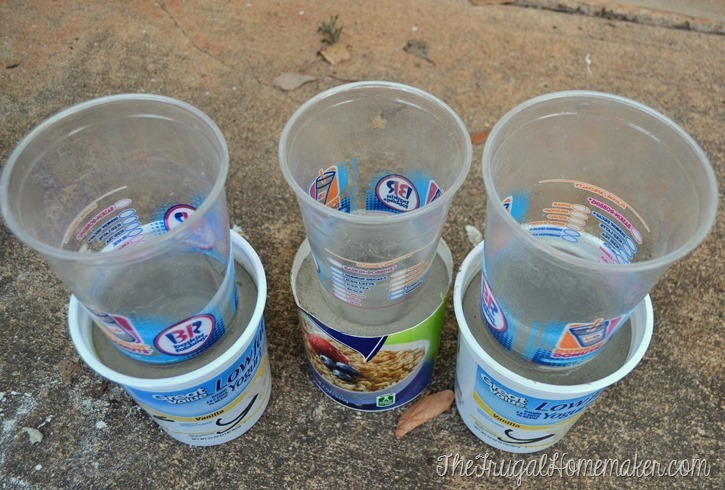 I poured the concrete into the larger yogurt containers and then used the Dunkin cups to form the indent part of the planter where the plant would go. I also did a flat concrete form for candles. This concrete sets up very fast! It was probably dry within an hour or so, but I let it dry overnight just to be sure. They released very easily from the containers and here’s my concrete planters! 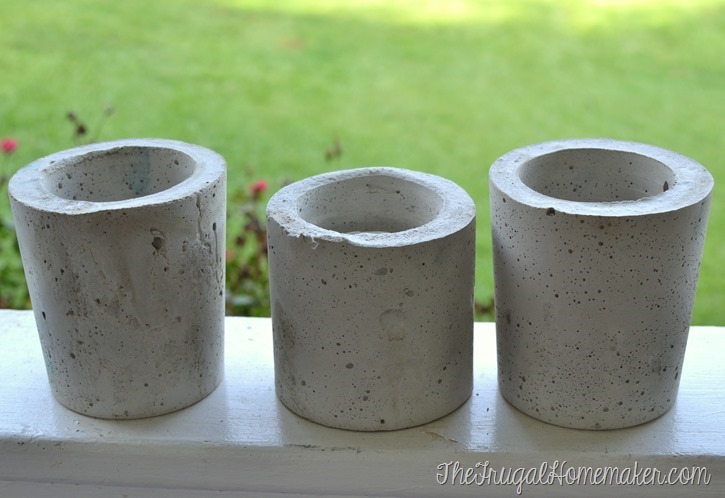 And my DIY concrete candleholder. 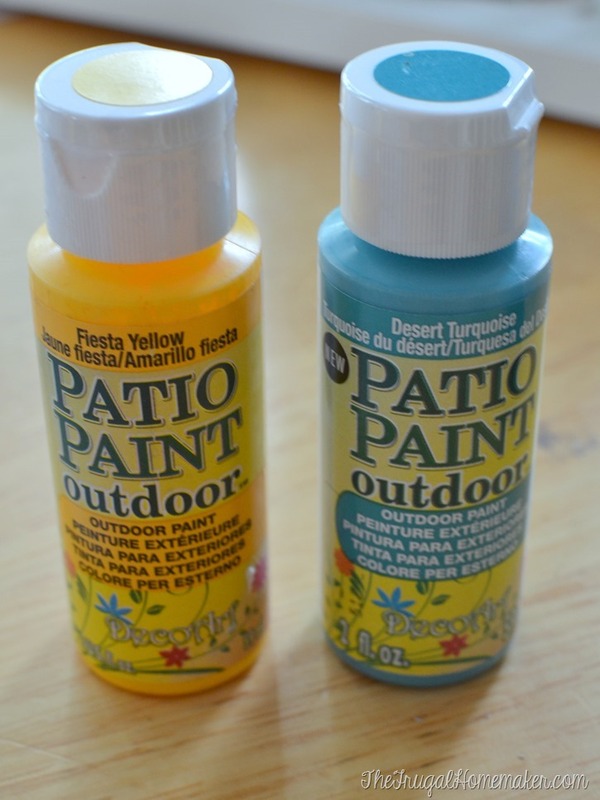 You could totally use these as is, but I chose to use DecoArt Patio Paint which is specifically formatted to be outdoor paint and adhere to concrete, terra cotta, wood, and more. I used Fiesta Yellow and Desert Turquoise. 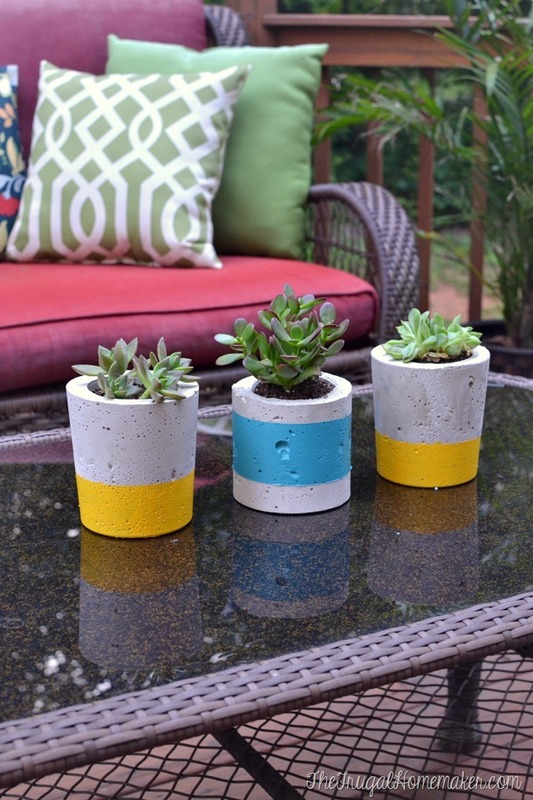 I taped off my planters and painted one with a stripe of teal paint down the middle and then a dipped look of the yellow paint on the bottom of the other two planters. I painted the outside of the candleholder block with the teal paint. I picked up some succulents to put in the planters and I just adore them!! Here they are out on my deck. 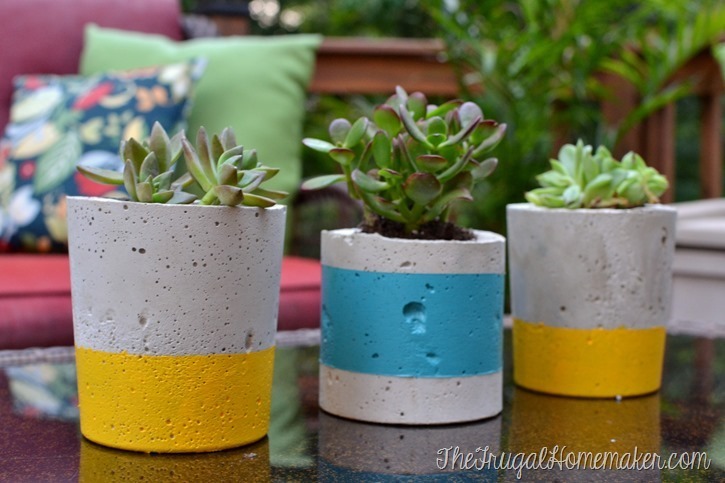 The concrete is a rustic/natural look, the paint adds a fun colorful touch, and the succulents – well, you just can’t go wrong with succulents. They are some of the cutest plants. 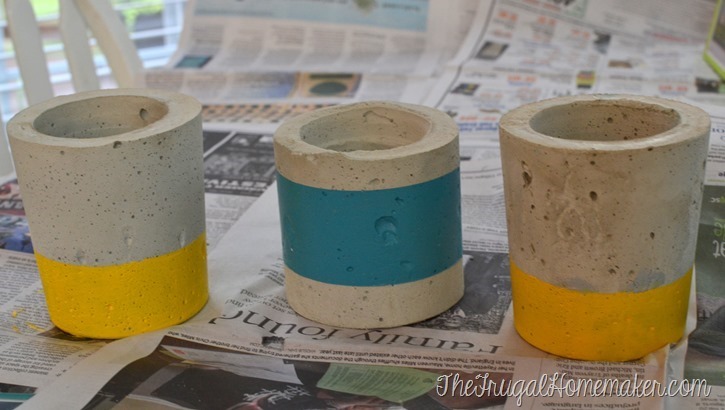 If you made concrete planters what color would you paint them and how you would you use them? And here’s the candleholder block on display. Again so fun! No worries about it getting hot, the candles not being secure, fear of it tipping over. 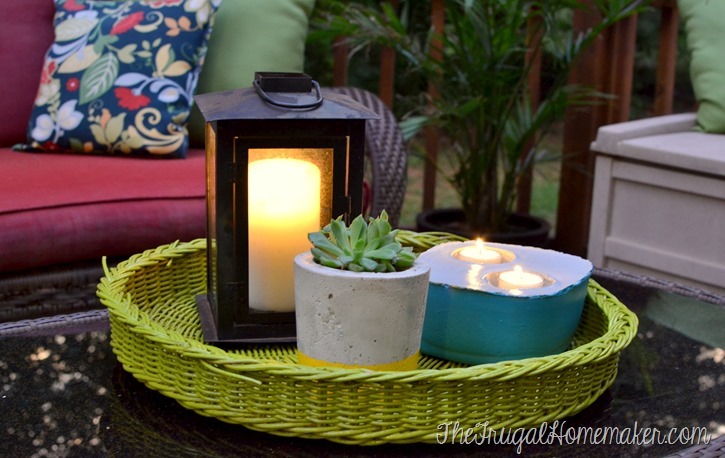 And you can use citronella candles for extra functionality if you want too. 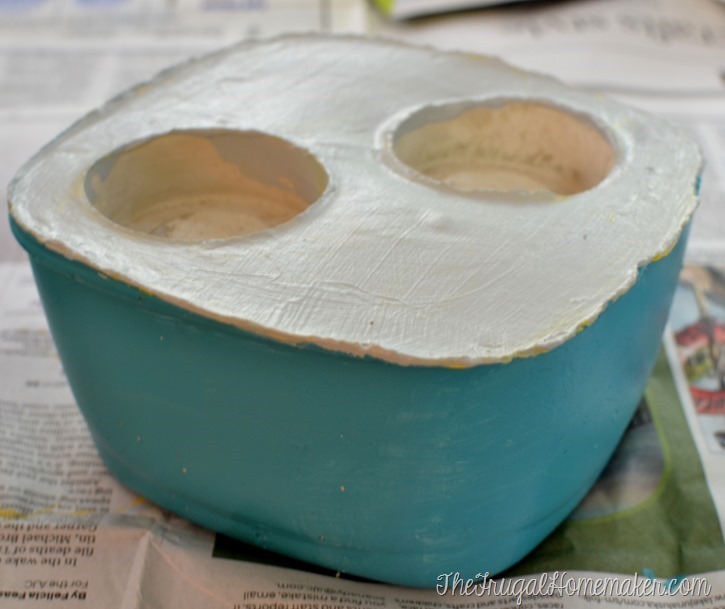 I really enjoyed learning how to create my own DIY concrete planters and I have a feeling I will be making some to giveaway later this year. So many options and possibilities and they create a unique, one of a kind gift. Have you ever worked with concrete? Painted concrete? What would you create and how you would use it? You can find more ideas for DecoArt Patio Paint on DecoArts website or follow them on Facebook,Pinterest, Instagram, or Twitter. Those are pretty cool. My wife would love this. This is really cute! I want to make some really big planters, but I don’t think I’ve got anything big enough to use this technique with. Maybe I’ll just use these for my indoor herb garden. 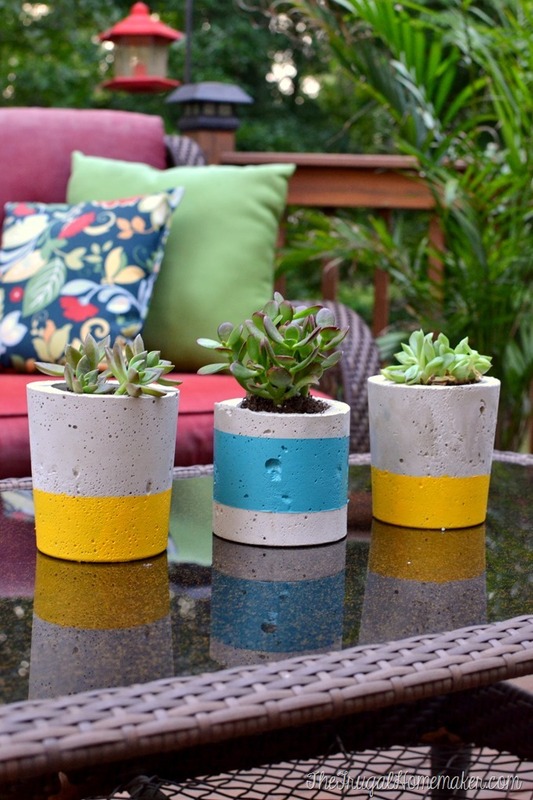 Can you use regular craft paint and then an outdoor sealer for an outdoor cement planter?